to sleep while they visit. From unexpected visits from in-laws to reunions with old friends – by providing your guests extra sleeping options in your home, you are helping them save money on hotel costs and cutting down on travel time. Make the most of your time with loved ones by creating a space for them to sleep in your home. Eliminate hassles for friends and family by decorating your home with multifunctional, alternative bed options from Belfort Furniture. Browse sofa sleepers, sleeper sectionals, futons or other guest sleeping options online or visit our Furniture Showrooms for a full display of available options and our favorite styles. Apartments, condos, and dorms can feel limiting but choosing a sleeper sofa allows you to create a multi-functional space. Easily transition your living room to a guest room when friends and family arrive with sofa beds. Transitioning from sitting area to sleeping space is easy with each couch sleeper’s unique setup. Effortlessly change your office, basement, or living room into a guest room during Holidays and family gatherings. When family are visiting from out of town, sleeper sectionals and pull out sofas are the classic option for guest sleeping. Allowing you to have a functioning gathering space that doubles as sleeping quarters, your cherished time with family members doesn’t have to end for Aunt Sue to drive to her hotel at night! You don’t have to compromise great style to provide flexible sleeping space for your guests! 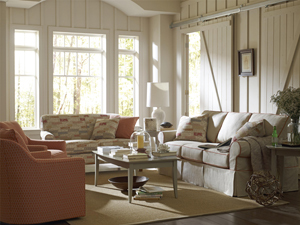 Sleeper sofas from Belfort Basics, Belfort Home, Bernhardt, Drexel Heritage, Kincaid Furniture, Palliser, Rowe, and more offer customizable options with fabric choices. Scroll through our sofa beds below to find your perfect piece.